Four days after the police eviction and a day after the worst police violence since the start of the protests, the indignados of Madrid are back in the square. There were tears. There were smiles. But above all, there were cries of victory. 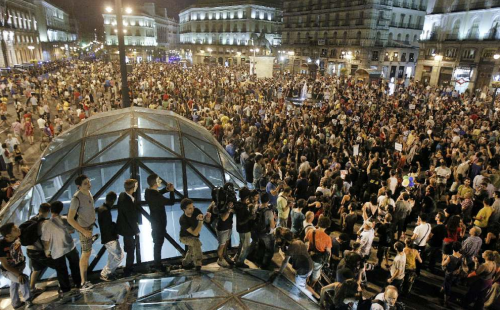 After a 4-day long standoff with police, who had evicted the square on Tuesday and effectively occupied it ever since, thousands of indignados (16.500 according to #acampadasol) tonight took back the square after yet another long march from Atocha. “The sun has risen!” cheered the ecstatic protesters, who just 24 hours ago had been bloodily bludgeoned by riot police as they demonstrated in front of the Ministry of the Interior. Today’s march made another symbolic stop in front of the ministry to protest last night’s violence. When the people finally arrived at Sol, balloons went up in the air and people jumped into each other’s arms in ecstasy. All in all, the reconquest of Sol is an incredible victory for non-violence and a testament to the fearlessness and perseverance of the protesters. 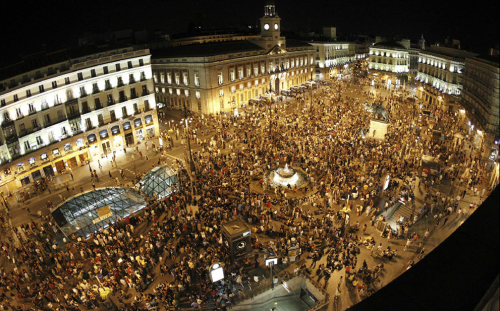 While it was always clear that the eviction of Sol would lead to a backlash, no one had quite expected the sheer scale of the spontaneous mass mobilizations that overwhelmed police and brought most of central Madrid to a complete standstill for the past four days. The festive atmosphere and subversive non-violence of the movement have once again proven to be strategically superior to the repressive tactics of those in power. The unpredictability of the indignados is simply irrepressible. The decentralized, networked movement operates like a hydra: cut off one head, and you’ll soon face thousands of angry faces in the streets. Take away the people’s square, and the people will take back all the streets. 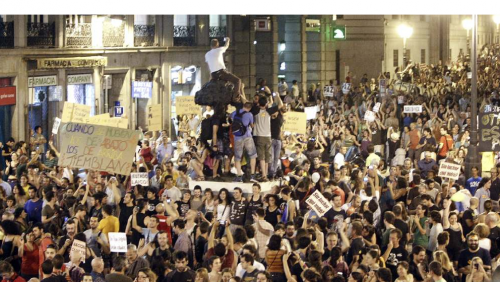 Interestingly, in abandoning the square this afternoon, Spanish police directly went against a government order that obliged them “not to allow protesters to return to the square at any cost.” The largest police union had previously criticized the government for the illegality of this order, requiring policemen to break the law in order to carry out government policy. Immediately upon returning to the square around 22:00 o’clock, the indignadossymbolically set up the first pole of a new information center. The movement’s permanent information point had been destroyed by municipal cleaners following Tuesday’s eviction. At night, a large popular assembly was held in the square. The assembly just finished around 1:30am, without taking a decision on whether or not to camp in the square. The choice to do so will be personal. It is unclear what the authorities will do next. On Tuesday, they kicked 90 people out of the square, but by Friday they got 16.500 back in return. 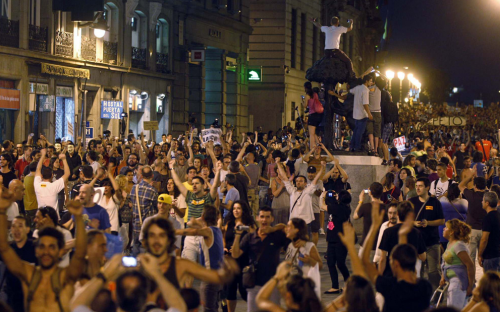 This is the same boomerang-effect we saw at the birth of the 15-M movement and during the attempted eviction of Plaça de Catalunya in Barcelona. 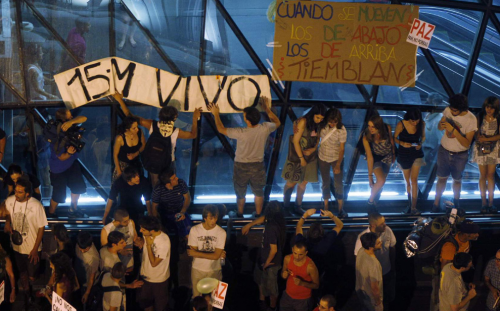 Will they allow the indignados to stay now that they realize their efforts will only backfire? Or will they attempt to evict anew? Part of it will depend on how many people decide to camp out. But whatever happens next, the police will now have to reckon with the sheer malleability and strength of this popular movement. The past four days were a potent reminder to authorities: you don’t mess with the constitutional right to peaceful assembly and political participation — and if you do, you only risk turning a simple square into a shining symbol of resistance. The people have woken up. And they will fight back peacefully till the very end. The sun has risen. The people cried. The square is ours.